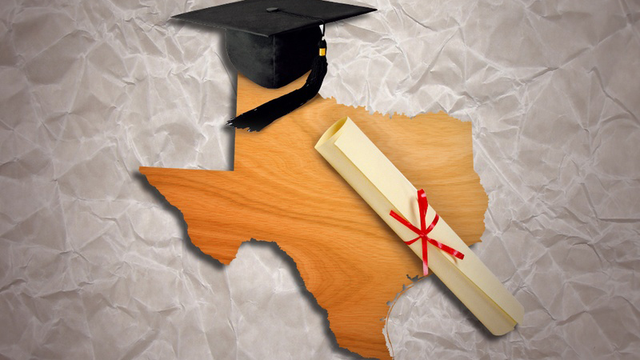 Texas education officials once again announced top high school graduation rates on Tuesday, reporting that 88 percent of public school students in the class of 2013 received a diploma within four years. It is the third year in a row that the state has posted record-breaking high school graduation rates, which have climbed steadily over the past six years. The state has also made gains nationally — in April, the U.S. Department of Education released a report that showed Texas tied for second place, with only Iowa reporting a higher rate for the class of 2012. While students across all demographic groups have improved their graduation rates over the last several years, a gap persists between Hispanic and African-American students and their white and Asian peers. Among black students, 84 percent graduated high school within four years, compared with 85 percent of Hispanics, 92 percent of whites and 93 percent of Asians. At 85 percent, economically disadvantaged students also graduated at rates below the statewide average — though that rate has also climbed by about 16 percentage points since 2007. But Texas still faces questions about the method it uses to calculate graduation rates, which critics say allows the state and school districts to mask true graduation numbers. "This is so far removed from reality it is Orwellian in nature. If you look at the raw data — ninth graders and then those who walk across the stage four years later — the graduation rate is closer to 72, 73 percent," said Bill Hammond, the president of the Texas Association of Business, which frequently advocates on education policy at the Legislature. The state follows federal procedure to determine high school graduation rates. School districts track student withdrawals, which they then report to the state education agency, under more than a dozen different “leaver codes." Only some of those student withdrawals — which include reasons like moving out of state or entering home school — get counted toward the overall graduation rate. That creates a system, Hammond said, that can allow schools to hide the number of students who drop out. According to the TEA report released Tuesday, about 50,000 of the original 360,000 students in the class of 2013 left the public education system between their ninth and 12th grade years for "for reasons other than graduating, receiving GED certificates or dropping out." Another roughly 5,000 students are unaccounted for because of missing records or misreported student identification information. Disclosure: The Texas Association of Business is a corporate sponsor of The Texas Tribune. A complete list of Texas Tribune donors and sponsors can be viewed here. This article originally appeared in The Texas Tribune at http://www.texastribune.org/2014/08/05/texas-posts-top-high-school-graduation-rates-again/.